Bishwa Ijtema 2013 Bangaldesh is going to be held from January 11. So all the authorities concerned have been asked to complete the necessary activities for taming the final preparation of Bishwa Ijtema by 6th January. They were also asked to inform the government about the progress of the preparation by 5th January. Bishwa Ijtema held in Tongi near Dhaka city- Watch The Map. The committee also has to submit final report regarding the Ijtema preparation by January 7. The committee was directed to complete all the necessary preparation of the Ijtema before the meeting of Home Ministry on January 6. Sources said government and Ijtema committee have been working jointly for a successful Ijtema this year. Contacted, Gazipur Police Super Abdul Baten PPM told that a programme of home ministry will be held on January 6 to discuss overall preparation of the Biswa Ijtma. Home Minister Mohiuddin Khan Alamgir, State Minister for Home Advocate Shamsul Haque Tuku, and local MPs, among others, will attend the programme. 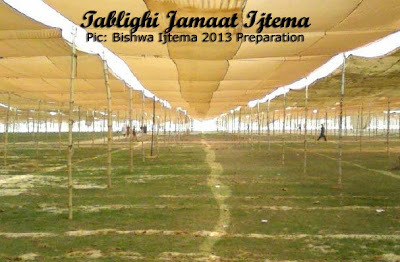 The first-phase of world famous Biswa Ijtema will begin on January 11 and it will end on January 20 in two stages.